Just when you thought Starbucks was done unleashing alarmingly colorful drinks like the Unicorn Frappuccino and the Zombie Frappuccino this year, it looks like the coffee giant has one more bizarre blended beverage ready to take over your Instagram feed again. 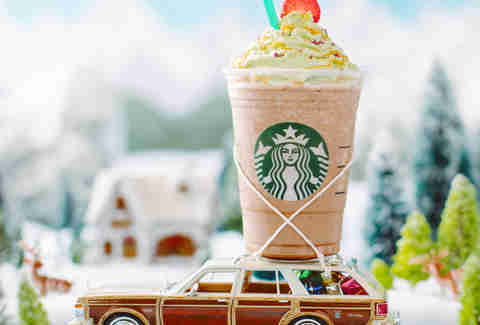 This time, you can expect to slurp a wild mixture of holiday covers with what's fittingly called the Christmas Tree Frappuccino. Yes, the whole thing is made to look just like a Christmas tree -- ornaments and all. Starbucks announced the limited-edition drink on Wednesday, saying the festive mixture features holiday flavors such as peppermint and a hint of cranberry. Specifically, it's made by taking a Peppermint Mocha Crème Frappuccino (the coffee free version) and topping it with a green matcha whipped cream “tree,” caramel drizzle "garland," candied cranberry "ornaments," and a strawberry "tree topper." Thankfully, there's no indication it'll actually taste like your family's blue spruce or your fresh balsam candle. Perhaps out of holiday-inspired mercy, Starbucks is offering the drink at its locations in the United States and Canada for only five days this month -- Thursday, December 7 through Monday, December 11, according to a spokesperson. Although the Christmas Tree Frappuccino lacks caffeine, it might just provide the sugar rush you need to get through a round of stressful holiday shopping this weekend. At the very least, you'll probably get an Instagram like or two out of it. 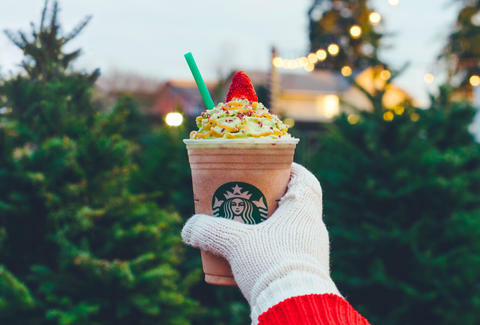 Thanks to the Unicorn Frappuccino, the Zombie Frappuccino, and now, the Christmas Tree Frappuccino, it's been a helluva year for sugary blended drink connoisseurs. Just image what Starbucks plans to unleash in 2018. Tony Merevick is Senior News Editor at Thrillist and thinks it's safe to say these things won't look as good in real life -- or after a few minutes of melting. Send news tips to news@thrillist.com and follow him on Twitter @tonymerevick.